We’ll be the first to admit that we live for a good beauty trick. Whether it’s how to fake thicker hair or ways to make your lipstick stay on through dinner, we mentally hoard just about every beauty tip, trick, and hack we’ve learned along the way. There’s a slew of products out there for every need under the sun (and then some), and navigating through your hair, makeup, nails, and skin care on a regular basis can get rocky when you don’t know the tricks of the trade. 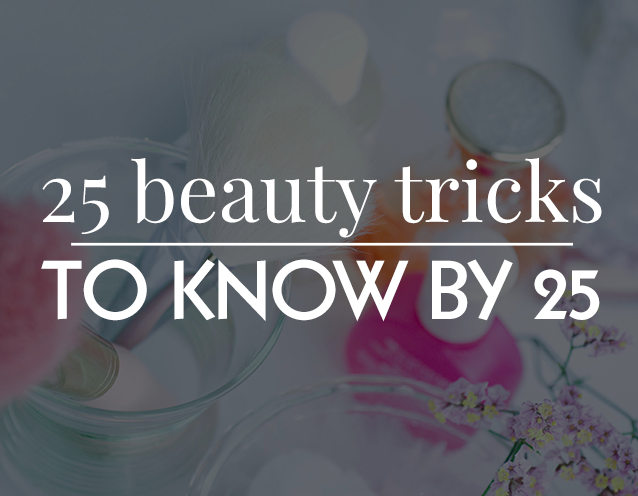 In an effort to equip girls everywhere with the beauty tricks they need under their belts by the time they’ve reached adulthood, we’ve compiled a list of our 25 best tips below. And, even if you’ve already surpassed 25, it can’t hurt to make sure you’re all schooled now, right? 1. Wet your makeup sponge before using it on your face for a smooth, even, natural-looking foundation finish. 2. To get rid of split ends without going for a full haircut, twist the lengths of your hair into a tight ponytail. 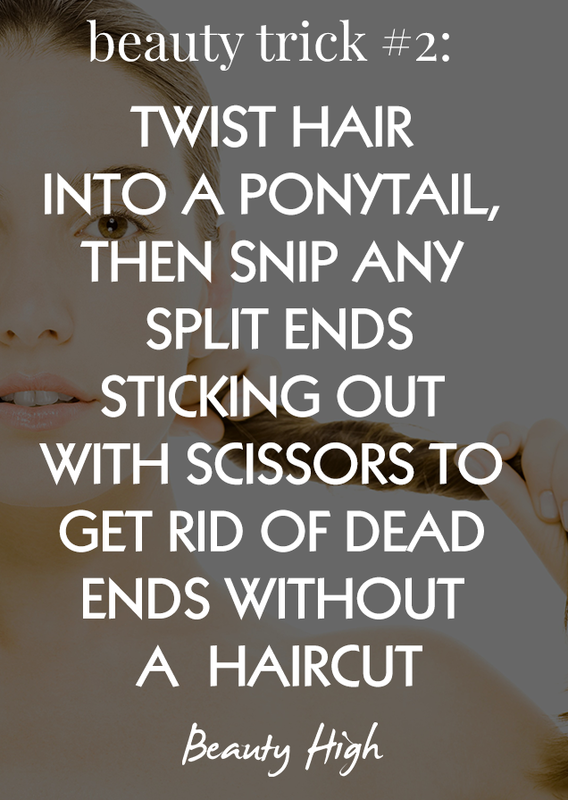 Wherever you see a stray, split end peek out of the twist, snip with scissors. 3. Press your hair dry with a cotton t-shirt instead of rubbing with a towel to reduce frizz. 4. After you paint your nails, use cooking spray from about 10 inches away and spray your nails to make them dry faster. 5. Clean up the edges of your cat eye or lipstick with a dab of foundation on a Q-tip, removing and concealing the stray marks at the same time. 6. Mix liquid highlighter with your moisturizer for a glow all over your face. 7. Crush up aspirin and mix with water until a paste is formed. Apply to a bikini rash or area with ingrown hairs to reduce swelling, redness and irritation. 8. Use your hair dryer to blow hot air on your eyelash curler for about 10-15 seconds before curling your lashes. The heat will help hold the curl, the same way a curling iron works for your hair. 9. To pack for maximum protection while traveling, tuck any fragile bottles (like perfume or hair oil) inside of your sneakers, and place them in the middle of your suitcase. 10. 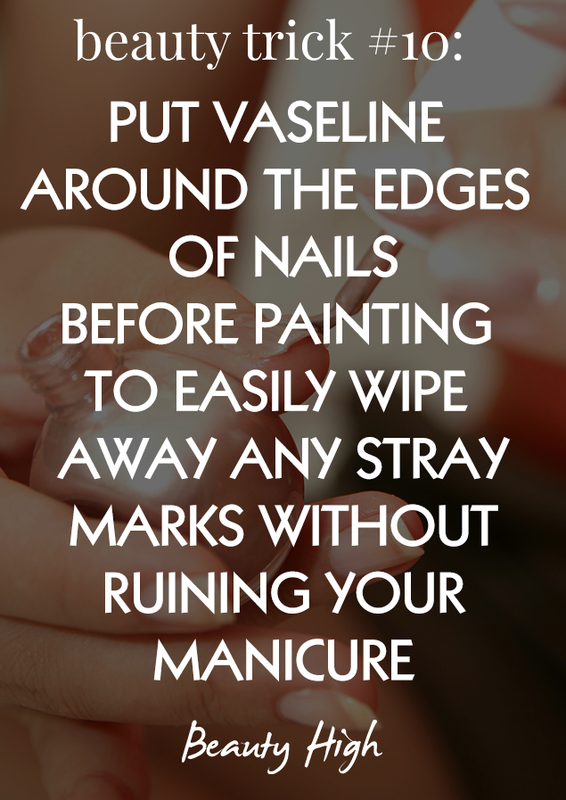 Apply Vaseline around the edges of your nails before painting them to easily wipe away any polish that may have gotten on your skin without ruining your manicure. 11. Add 3-4 eye drops to a tube of dry mascara to re-hydrate the formula and give you a smoother, fuller application. 12. Section your hair out about 4-5 times and braid each section loosely. Go over each braid with a flat iron, then undo your hair to reveal perfect beach waves. Tousle and apply sea salt spray for a more natural look. 13. To keep your skin acne free, wash your hands before washing your face. Also, use separate towels for drying your hands and drying your face so bacteria isn’t passed from your hands to your skin. 14. Exfoliate your lips with a toothbrush and sugar scrub before applying lipstick for a smooth, even finish. 15. For a tight, clean braid, use just a pinch of hair wax as you braid to keep stray baby hairs in place. 16. To prevent blisters, rub clear deodorant on your heels (or anywhere your shoes rub against) to ease the friction that can cause skin irritations. 17. Dust just a bit of baby powder over your eyelashes before applying mascara. The powder will act as a primer, giving you thicker, lush lashes. 18. On long days when you need your makeup to last, apply a cream or liquid formula first, then follow it with a light application powder. Whether it’s foundation, eyeliner, blush, or anything else, the powder will absorb any excess oil that may make the product slip off your skin, while also intensifying the color. 19. To make your lips appear larger, begin by applying lip color as you normally would. Then, with your finger, dab the same color but two shades darker into the center of your top and bottom lips. This will trick eyes into thinking your lips are fuller. 20. For healthier, shinier hair, start using a co-wash. Alternate between shampoo and a cleansing conditioner on days you’d normally wash your hair, giving your scalp a chance to absorb the natural oils it produces without stripping them away with shampoo every wash.
21. When booking a waxing appointment, aim to get it three or four days after your period, when your pain tolerance is at its highest. 22. 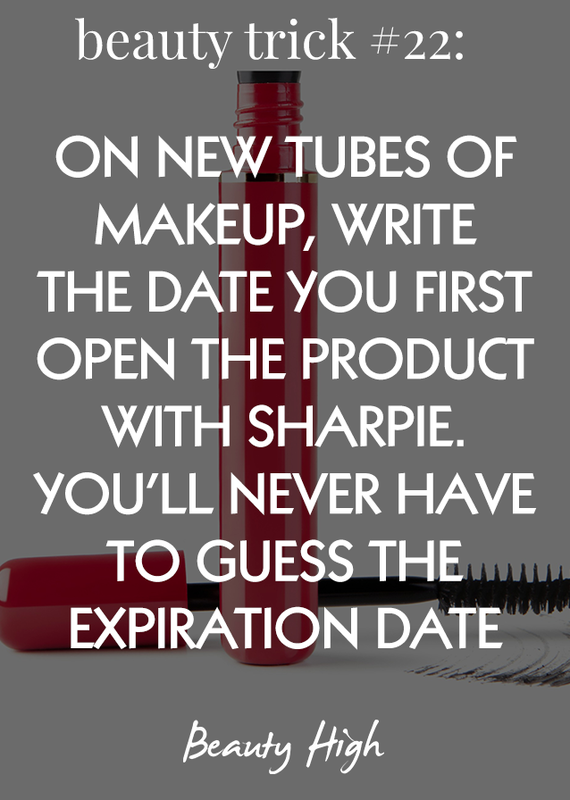 When you buy a new product, write the first date of use on the tube or jar. You’ll never be wondering whether or not it’s expired. 23. For second day hair that needs a boost, shake root lift powder into the roots. Then, use a curling iron from the bottom of your hair upwards and inwards, and you’ll look like you got a fresh blowout at the salon. 24. Use concealer as a primer and base for your eyeshadow to stop any creasing that may happen. 25. Have three five-minute hairstyle techniques (a side French braid, a twisted ponytail, and a sock bun) down pat for mornings when you’re in a rush and you’re having a bad hair day. Being prepared with a plan means bad hair days will happen way less often.